Events shown are 2018. Check back for 2019. Events are in Bryson City/Swain County unless otherwise noted. Events are subject to change. For detailed information, visit event websites. Daily ranger led programs in the Great Smoky Mountains National Park (October). 828-497-1904. Farmers Market– Every Friday morning May thru October, 9 am – 1 pm on Island Street in Bryson City. September 20 – October 31- Fall Events at Darnell Farm: Sunflower Maze (opens early October) & Pumpkin Patch daily (open now). Hayrides, Thursday – Sunday. Haunted Trail the week of Halloween. September 22 – “Uncorked” event train food with wine pairings. All adult-first class car. September 22 – Swain County Agricultural Fair. Swain County Event Park, 10 am – 10 pm. Demos, crafts, food, live music and judging of vegetables, eggs, flowers & animals. September 22 – Octoberfest at Nantahala Brewing. Traditional German dishes and fun family games. September 29 – Mountain Heritage Day at Western Carolina University, Cullowhee. 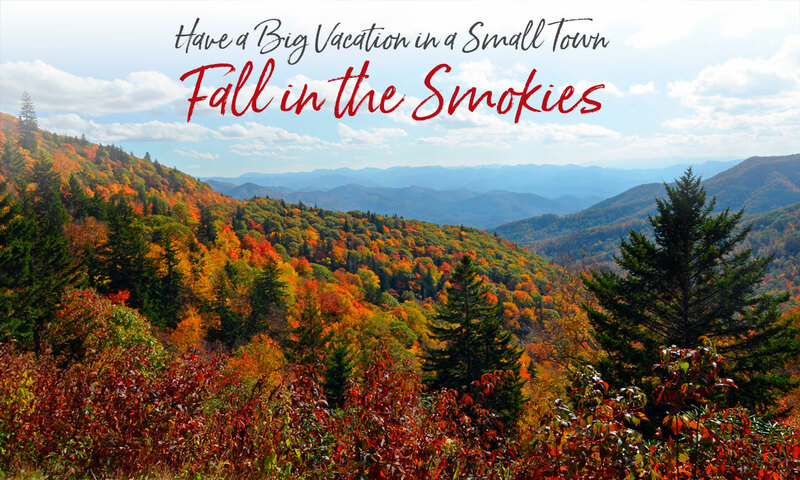 September 28-30 – Guest Appreciation Festival at Nantahala Outdoor Center. October: Fridays thru Sundays – Peanuts Pumpkin Patch Express Train Event. Ride to pumpkin patch, meet Peanuts charactures, enjoy activities and music, pick your own pumpkin. October: Fridays & Saturdays – Spooky Tales at the Storytelling Center. 8 pm, around the fire pit in the train depot area. October: Fridays & Saturdays – Cherokee Bonfire & Storytelling, 5-7 pm. Islands Park in Cherokee. October 5-14 – Smoky Mountain Arts Festival under the big tent at the train depot. October 6 – ColorFest arts and crafts show, Dillsboro. October 6-7 – Fall Festival at John C. Campbell Folk School, Hayesville. October 13 – Smoky Mountain Fly Fishing Festival. 9 am – 5 pm at the Warehouse at Nantahala Brewing. October 13-14 & 20-21 – The Inspirations Fall Color Gospel Festival, 2 pm daily. Swain County Event Park. October 19-20 Cruise the Smokies Fall Rod Run, Cherokee, 9 am – 5 pm. October 19-20 – Stecoah Harvest Festival, crafts, food, music and country fair, Stecoah. October 20 – Southeastern Downriver Championship. 8 mile course on the Nantahala River. October 24 – November 10 – Oconaluftee Indian Village open Tuesday – Saturday, 10 am – 3 pm. Tour the authentic working village with dwellings, residents and artisans right out of the 1760’s. October 26-27 – Witch’s Brew Release & Halloween Party, Nantahala Brewing Co. Live music. October 26-31- Fear Farm at Darnell Farms: Starting at dusk (8+years and up recommended). $10 per person. Hayride and trail experience through the spooky fields of our already mysterious farm. Tales and origins of missing mountain folk originating right from this area. Also Pumpkin Patch daily and large field of sunflowers. Hayrides, Thursday – Sunday. October 27 – NOCtoberFest Great Pumpkin Pursuit, games and music on the Nantahala River. October 31 – Downtown Trick or Treat. 4 – 7 pm safe trick or treating with merchants on Everett Street in Downtown Bryson City (street is closed to vehicles). October 31 – November – Beer Tastin’ at the Station. On all Great Smoky Mountains Railroad Tuckasegee River Excursions. At the Dillsboro layover you’ll visit a reserved seating area at Innovation Brewing and sample 4 of their beers with food samplers from Foragers Canteen. November 3 – WNC Pottery Festival, Dillsboro. Potters from all over the country demonstrating and selling their beautiful and functional pottery. November 3 – “Uncorked” event train food with wine pairings. All adult-first class car. November 3-4 – Rumble in the Rhododendron Fly Fishing Tournament, Cherokee. November 10 – Heritage Arts Festival, 10 am – 4 pm. SW Community College/Swain Center. Peanuts Pumpkin Patch Express – Friday-Sunday in October. Enjoy the ride, play games, pick out your own pumpkin & meet Charlie Brown, Lucy & Snoopy. ‘Shine & Dine’ all adult first class moonshine car featuring Junior Johnson’s Midnight Moon Spirits. Nantahala River excursions. Hearing a bull elk’s bugling during the fall rutting season is a memorable experience… that comes with a caution. While the animals are not frightened by humans, they are wild and potentially dangerous, particularly during mating season when the males are aggressively guarding their harems. Observers should stay at least 50 yards away and use binoculars or telephoto lens for a closer view. Where to view elk. For years following the herd’s 2001 reintroduction into the Great Smoky Mountains National Park, elk watching meant driving deep into the Cataloochee area of the park, about 1.5 hours from Bryson City. 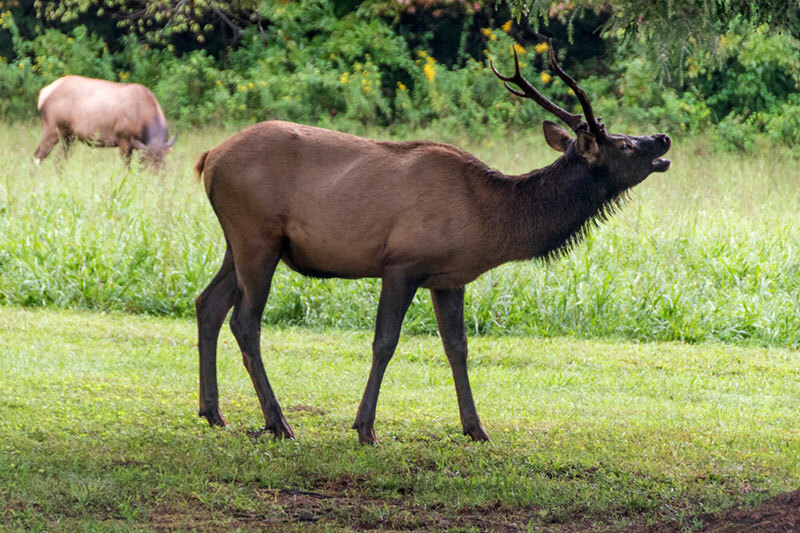 But these days, you’re just as likely to see elk grazing in the fields next to the Oconaluftee Visitor Center in Cherokee, or in the lowland fields along US 441 in the National Park, or in the Job Corps Civilian Conservation Center just north of park visitor center.